You are here: Home / Investing / VIX index : What Is It And How Is It Used? VIX index : What Is It And How Is It Used? 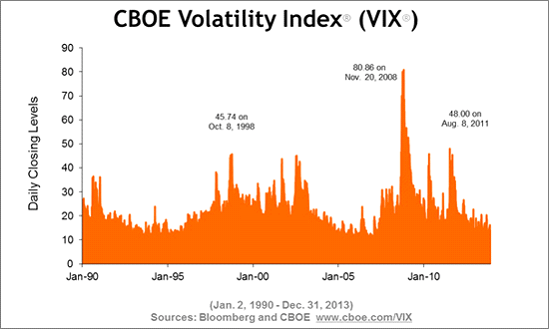 You may have heard people and news articles mention the VIX index. It is a somewhat complicated index to understand at first, but when you get into it, you start to realize what a unique index it is and all the things it can indicate in the market. This article is going to focus on understanding what the VIX is, how it is used in the markets, in practice, and of course how you can trade it for some profit – because that’s what this is all for at the end of the day! It has several names such as the volatility index,VIX index, the fear gauge or the fear index. You get the point, it is measuring the risk involved in the markets. The VIX is a weighted blend of prices for a range of options on the S&P 500 index. Now we don’t need to be options masters here, but keep in mind the goal is to estimate the implied volatility for the S&P 500 index over the next 30 days. We will not go in depth into its valuation and theoretical points here, but rather focus on the application and meaning behind it. The VIX trades at a price, and this price is actually a percentage point. So if you are looking at a price of lets say 18, then there is a 68% (c’mon now guys – basic standard deviation, 68% is one standard deviation under normal distribution) chance **according to market expectations** of a move less than 18% up or down in the S&P 500 index. Again, without getting technical on option valuation, the basic idea is that put and call options can be used to measure implied volatility. This is because volatility is actually an input to option calculation. Therefore we can circle back and see the implied volatility of the asset they are based on, in the VIX’s case – the S&P 500. 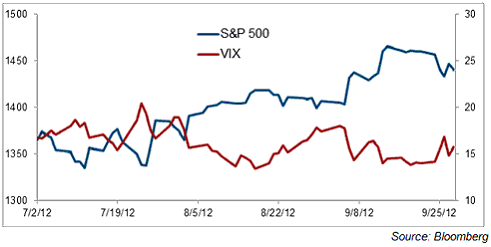 This chart shows the relationship between the VIX and the S&P 500. You can read more here, but the idea is that over the period, the VIX moved opposite to the S&P 500 Index 80% of the time, showing its strength as an indicator. Let’s not forget here that just because it is known as “the fear index” this does not imply a downside risk. It implies volatility and that is both positive and negative. You can see this in situations such as the lead up to Brexit where the VIX spiked in response to the first few votes indicating a swing towards the ‘leave camp’. Situations like this are great to play the VIX – if you are making the right calls of course. 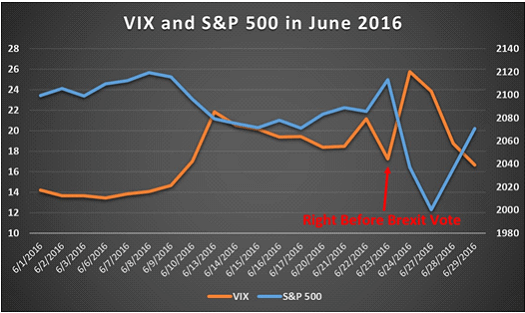 You can see the VIX reaction to Brexit below. TVIX Twice (2x) the daily performance of the S&P 500 VIX Short-Term Futures Index ER (Bloomberg: SPVXSP). XIV Linked to the inverse of the daily performance of the S&P 500 VIX Short-Term Futures Index ER (Bloomberg: SPVXSP). You can trade these ETF’s from any brokerage account. You can see our review on the top brokers of 2016 here. This article is not meant to highlight the VIX index as the “be all to end all” indicator of market volatility, but it is the most well known. Several criticisms of VIX are out there. They are important to keep in mind when doing your research and making a VIX ETF play on the perceived volatility of an event(s). The VIX is a highly unique product that can be used to trade events in the world and perceived volatility. The key word here is perceived, and not always what reality actually is – Brexit is a prime example. It is a highly risky trade, especially when using leverage products, but hey, no risk no return eh?